Happy 2015! I hope your year is off to a fabulous start. =) After a break from blogging in December to maximize my family time during the holidays, I’m excited for a new year of cooking, crafting, photographing my creations, + sharing them with you. First up? 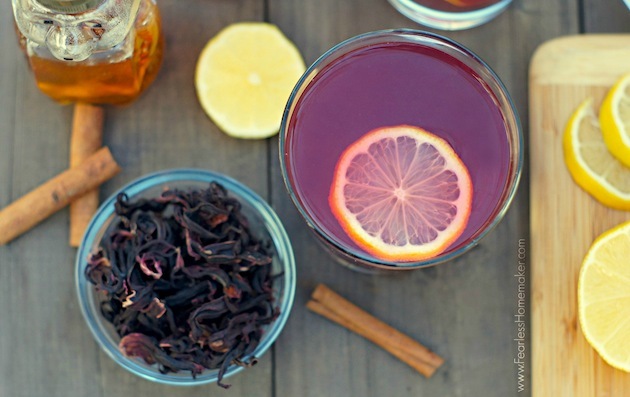 This AMAZING Spiced Hibiscus-Ginger Tea. As some of you may know, I’m a HUGE lover of herbal beverages + teas. I even belong to a Tea Of The Month Club where I get to try a new blend every month. Surprisingly, I rarely experiment at home with making teas and herbal drinks, though. That will definitely now change, because this recipe turned out so delicious + was surprisingly simple to make. 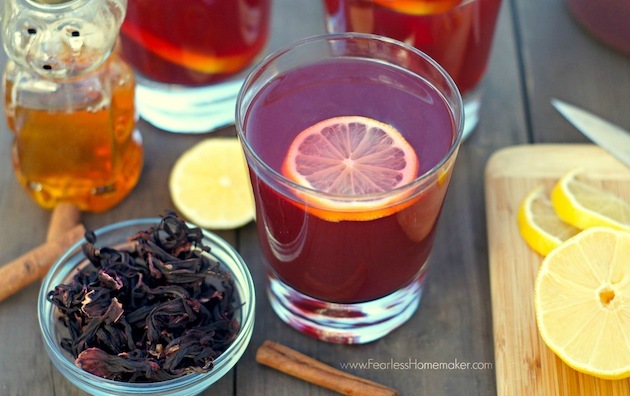 This tea has amazing spicy, earthy, belly-warming notes from the ginger, allspice, + cinnamon, a tangy-tart bite from the hibiscus, some brightness from the lemon, + a hint of honey sweetness. This drink is wonderfully versatile – you can serve it hot or iced, and non-alcoholic or boozed-up with some bourbon. I actually loved this SO much as a non-alcoholic drink that I didn’t try the boozy version, but one of my friends who also has made this recipe assures me that the bourboned-up twist is wonderful. Since it’s caffeine-free, I’ve been enjoying a hot mug of it right before bed, which is such a nice, homemade treat. Combine 8 cups water, ginger, cinnamon, + allspice in a large saucepan. Bring to a boil, then reduce heat + simmer until flavors infuse liquid, 20-25 minutes. Remove pan from heat + stir in the hibiscus petals. Cover + let sit for 10 minutes. Strain into another large saucepan if serving hot, or into a pitcher if serving cold. Add honey + lemon juice, stirring until honey is dissolved. If serving hot, continue to next step. If serving cold, chill for at least 3 hours. Just before serving, stir in bourbon, if using. Serve in mugs or rocks glasses (with ice, if serving iced), garnished with lemon slices. Do ahead: Tea base can be made 4 days ahead. Keep chilled until ready to serve, then serve iced, or reheat tea over low heat. That sounds like the perfect drink to enjoy in front of the fire, Amy. Happy 2015 to you, too! This sounds really delicious with or without the bourbon. I’m a huge tea fan as well and know I’d enjoy this drink. Happy New Year! I love the sound of this! Just the right balance of sweet and floral and spicy; perfect winter sipping. Cheers! This cold weather has me consuming mass quantities of tea (and maybe some bourbon too at times.) This sounds so comforting. Happy 2015!! homemade tea! what fun! this sounds wonderful. i just bought two new boxes of decaf tea for the winter so i can sip at night i need to try to make my own! Looks amazing and I bet the addition of bourbon makes it perfect for these upcoming cold days we are suppose to be having. Hope you and your family have a wonderful New Year! This looks incredible! I love tea and never thought to make my own. Herbal tea is so pretty too. It just puts me in a good mood whenever I have a cup. Tastes good, looks good, smells good. Cannot ask for much more than that. This is something new that I have try, wife would love this (I hope). Did anyone tried the herbal tea? Does it taste good? Happy New Year, Amy! Hope you enjoyed the holidays with your sweet family This tea looks so pretty and sounds perfect to get cozy and curled up with by the fire! I love the warm and comforting spices in here! Well doesn’t this look amazing!! Talk about a refreshing way to start 2015!! 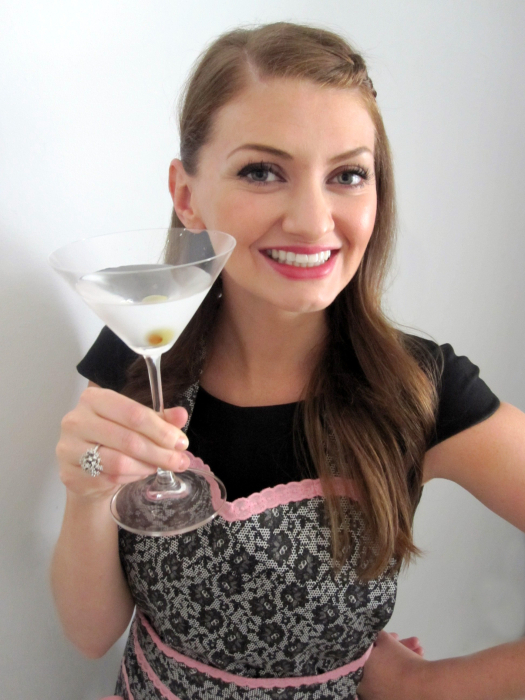 Lovely recipe girl!! Looks so nice! Sounds delicious and a clean and zingy way to start the new year! Oh this does sound amazing and the colors are amazing too. Great post! This sounds great. I love the idea of the addition of ginger and spices. I make Hibiscus tea often in the summer, and we enjoy it as a base for various alcoholic drinks. This one sounds just terrific. Happy New Year to you! I love tea – both for drinking AND for baking! I grew up drinking hibiscus tea (my Chinese grandmother is a big tea drinker). I know for a fact that hibiscus and ginger is a good combination for winter – to keep those nasty sore throats away, too! I’ve made this twice and LOVE IT! I use double the honey because I like it super sweet. I drink it hot and pretend it’s mulled wine (preggo over here), but my husband mixes it with bourbon hot or cold and loves it, too! Oh, I am SO thrilled to hear that, Christina! I remember you tweeting last month that you were going to try it, and I was hoping that you loved it. Hooray! And it totally reminds me of mulled wine, too. =) Thanks for popping by with your nice feedback! Previous post: Top 10 Recipes of 2014!